GET YOUR GREEK ON! Come enjoy Greek Express Food Truck on Friday, June 30th from 10 AM - 7 PM. 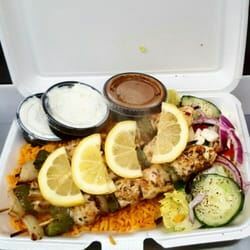 That's right, due to a special request from the swim team parents (and the availability of the food truck), Greek Express is available to feed us all day!!! He will have a variety of food options (not just Greek), so the possibilities are endless!!! Note: All other food trucks will there for dinnertime only, so this is certainly a special treat! !